Once upon a time I had a relatively outlandish and mostly unrealistic business idea. My idea evolved out of my long-term frustration with the massive amount of waste created by people in New York City who order food delivery. First of all, a staggering amount of New Yorkers order delivery. The busiest among us buy three meals a day, never cooking on their own. Food delivery comes in plastic containers with plastic forks and knives and spoons, sets of which are usually individually wrapped in plastic, all of which is tucked into a paper bag and carried to customers in at least one or two plastic bags. And all of this waste piles up per person, per meal, sometimes three meals a day multiplied by millions of people who live in New York City. The amount of garbage is staggering. 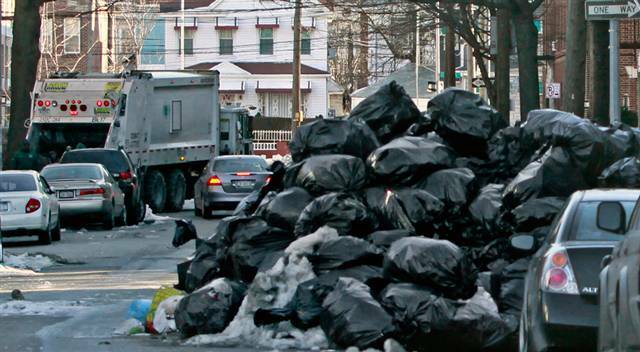 New York City spends $2.3 BILLION annually on garbage collection and disposal. Our trash is sent out of state, by truck and by rail, as far away as Virginia and South Carolina, all at tremendous expense to taxpayers. I envisioned something better. An innovative city-wide sponsored initiative, like Citi Bikes… I envisioned a re-usable system where customers would be given sleek, attractive and functional stainless steel containers with stainless steel forks, knives and spoons and canvas bags and fabric linens… All items would be tagged and tracked for accountability. The customers would receive their food in these reusable containers, and once they finished eating they would drop them off at receptacles located in all residential and commercial buildings… A system of trucks would collect used items where they would be washed and sanitized outside the city and then brought back to associated restaurants. Consumers would get rewarded with loyalty points for participating. In my pursuit of cost savings I kept wishing that I could finance this project with carbon offsets to inject enough extra cash into the scheme to maybe get it off the ground. But that option wasn’t really available to me because my project didn’t reduce carbon emissions. My idea would put more trucks on the road and require more energy to clean the containers. Carbon wasn’t the thing being eliminated by my plan. But there was still an environmental benefit: a reduction in waste, not a reduction in carbon. So I asked: Why not finance this project with waste offsets? My plan was probably too far-fetched to work even with subsidies. But there are other potential projects brewing in the minds of would-be start-ups that are far more cost effective that have the potential to save mountains of waste – projects that can’t get off the ground from the get-go because they’re just slightly too expensive. But with financial incentives that bring smart and useful ideas to life, we can start to turn the tide on our wasteful habits. In the 1980’s there was virtually no energy being generated from the sun or the wind or the tides. Now solar panels and wind farms and tidal energy turbines abound and a growing percentage of our energy needs are being met by these renewable sources. The carbon market was a crutch that helped get those technologies off the ground in a time when renewable energy couldn’t compete with cheap oil. The same can happen with waste reduction if we build the models. In my effort to bring waste offsets into reality I have talked to chief economists at some of the world’s leading environmental agencies, I have met with law school professors and college design professors, I have met with politicians and with current and former UN delegates and I have met with countless entrepreneurs and venture capitalists. To personalize this journey and garner support, I have decided that going forward I am going to blog about the process of pushing this initiative, recording the steps I take and the people I meet along the way and the advice I receive and the support I gather.